The European Union has launched a Flagship on Quantum Technologies to promote research into and development of quantum technology throughout Europe. The EU will be investing a total of EUR 1 billion over the next ten years. Flagship programs are large, interdisciplinary European research initiatives. A segmented ion trap used to utilize quantum bits stored in ions for quantum operations. The trap is made of gold-coated ceramic, and the segments at its center are only 0.2 millimeters in size. On 29 October 2018 at the Vienna Hofburg, the European Commission launched the flagship initiative and its approved component projects, each of which was previously reviewed in a highly competitive selection process. Johannes Gutenberg University Mainz (JGU) is involved in two of these projects and will receive funding of about EUR 1.4 million. Quantum technology is a comparatively young field. It is here that the bizarre phenomena associated with quantum mechanics – originally described more than 100 years ago by the German researcher Max Planck – are harnessed for technological applications. Quantum technology involves finding ways of controlling individual atoms, ions, solids, and light quanta. A first quantum revolution paved the way for application-relevant technologies such as transistors and lasers. Now, research associations are embarking on a second quantum revolution. The EU Flagship initiative aims to ensure that Europe is at the forefront of this second quantum revolution. In the long term, the program will cover a broad spectrum of applications, including powerful quantum computers and quantum simulators, novel quantum sensors, and a tamper-proof quantum Internet. Professor Ferdinand Schmidt-Kaler's group is embedded in the QUANTUM – Quantum, Atomic, and Neutron Physics – research at the Institute of Physics at JGU and is involved in the construction of a quantum computer based on trapped ion crystals. By exploiting quantum mechanical properties such as superposition and entanglement, such a computer could solve mathematical problems that even the most powerful conventional supercomputer would not be able to solve. Quantum computers rely on the fact that increasing the number of qubits in a quantum processor exponentially increases its computing power. 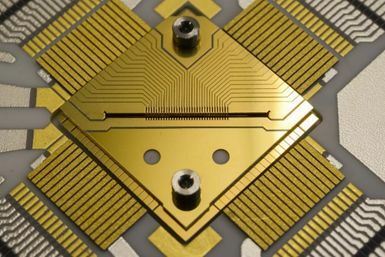 Building on preliminary work with smaller quantum processors with fewer than 10 quantum bits, the scientists are aiming to develop a prototype with 50 to 100 quantum bits. The EU project "Advanced Quantum Computing with Trapped Ions" (AQTION), funded to the tune of approximately EUR 10 million, comprises eight European research groups and industrial partners and is coordinated by the University of Innsbruck. Professor Dmitry Budker's team, also part of QUANTUM at the JGU Institute of Physics, is contributing to another Flagship project, which aims to establish quantum metrology techniques based on nitrogen vacancy centers in ultrapure diamonds. These have the potential to yield viable solutions in many areas of technology and business. For example, they could make possible the development of highly sensitive detectors for medical applications such as magnetic resonance imaging, for detecting diseases at an early stage in the form of a lab-on-a-chip, or in novel probes that measure temperature in the interior of a cell. Exploiting quantum effects, the "Advancing Science and Technology through Diamond Quantum Sensing" (ASTERIQS) project aims to significantly improve sensitivity and accuracy in diagnostics and metrology. This work, conducted by 23 European research groups, will receive funding of almost EUR 10 million and will be coordinated by the French Thales Group.